The story I’m about to lift the lid on is one of the closest kept secrets of the game of cricket; one that ex-players have only dared whisper to each other, late in the bar, long after the umpires have called off play for bad light, lightning strike, or locust infestation, and they can be – fairly – sure their co-conspirator isn’t ‘batting for the other side,’ to use that phrase in its proper, non-sexual, sense. To be sure, the Black Ops Division of the MCC have their spies everywhere, although there are worse things than being waterboarded in the hidden spaces beneath the Long Room at Lord’s. Just ask anyone who’s been interrogated by the Dandy Bradmans, and has survived with enough wits intact to tell the tale. But we’re getting ahead of ourselves. First of all, let’s be clear what we’re talking about when we use the phrase ‘Scots-Irish’ and ‘cricket’ in the same sentence. Cricket is probably the easier definition. For our American friends, we don’t mean the small insect of whom Jiminy is probably the best known spokesperson. No, this is the game of cricket, a game invented, according to George Bernard Shaw, because the English are a people so lacking in spirituality, they needed something to give them an idea of eternity. So far as the Scots-Irish we’re describing here, we’re not talking about the many Scots and Irish cricketers who have either played for their own countries, or indeed for England. There are a few examples of the latter: amongst the Scots who have played for England, there is Bellshill-born Mike Denness, who captained the Poms 19 times. More infamously, although Douglas Jardine was born in India, he came from Scottish stock, and how much of his infamous Bodlyine tactics of instructing fast bowlers to intimidate the Aussie batsmen with short pitched deliveries on leg stump was dreamed up at his auntie’s in St Andrews we’ll never know. There are loads, too, of Irish cricketers. The only one I can think of right now is Eoin Morgan, who has played a bit for England in recent years. Anyway, these are not the subject of this exposé. Instead, it is a tale of a body of cricketers who – given the right economic and, crucially, culinary circumstances, could have made both Scotland and Ireland the equal – or at least half-decent rival – of the English, but were cruelly denied that chance. Our tale begins with the humble potato, a vegetable which, in its non-fried form, contains particular nutritional qualities. First brought back to Europe by the Spanish conquistadors in the middle of the sixteenth century, it developed into a staple across the continent over the next few centuries. However, it is its particular affinity to the Celtic fringes of the northern and western British Isles that informs our story. Perhaps surprisingly, given their South American origin, potatoes grow well in Scotland and Ireland under normal conditions. The prevailing south-westerly winds keep aphids off, avoiding the spread of the viruses which are normally the greatest check to this herbaceous perennial’s progress. Even more surprisingly, the potato’s particular mix of minerals, vitamins and phytochemicals, along with the more obvious carbohydrate, and a small amount of high-quality protein, seem to provide the perfect dietary supplement to those of Celtic origin – at least, in their non-fried form. This first became apparent during the eighteenth century, as Scots and Irish began to be noted as increasingly imposing physical specimens. Early Jacobite victories such as Killiecrankie were put down to the Highland Charge, where basically the clansmen ran very quickly and scarily at the Government troops before the latter had time to reload their muskets. Whether pommes de terre á la surprise also acted as a brain food to fuel the Edinburgh Enlightenment is still the subject of much research. However, what is clear is that, by the end of the century, the pacification of the Highlands, and, separately, Ireland, was a major issue for the London authorities. Much is made of General Wade’s road building to places like Fort William and Inverness, the proscription of Gaelic, and the banning of tartan. What is less well-known is Wade’s lieutenant, Twistleton-Smythe, and his own project to Anglicise the natives by teaching the emerging so-called English game of cricket. Imagine the scene, if you will. A remote Highland glen, a mist providing assistance to outswing. A lone bagpipe droning, far off. The redcoated Twistleton-Smythe, nervously tapping his bat on the crease as, in the distance, a huge Highlander hawks, spits at the end of his run up, adjusts his unfamiliar britches and starts his approach to the wicket, Maris Piper in hand. It’s true: recently uncovered records show that, in the absence of proper cricket balls, the Highlanders improvised with their favourite foodstuff, the buntáta, passing down recipes for hardening them through the generations to make the most of peat-based wickets that, in rare dry spells, would favour fast bowling. The century spanning Culloden, the Highland Clearances, and the Great Potato Famine of the late 1840s, are too dark a period in Scots-Irish history to make light of. However, what is now clear is that, by the late nineteenth century, a Celtic diaspora was spread far and wide through the British Empire and beyond – and many of them were playing a game first taught them by their imperial masters. The evidence of this was at first subtle. Take, for example, the most famous Australia-England cricket match of all – the 1882 match where the Aussies crushed the Poms so utterly that a group of England supporters inserted a mock obituary of England cricket in the Sporting Times and gave birth to the legend of the Ashes itself. It is true that the Aussie team that day contained the obvious Scots-Irish names: Murdoch, Boyle, and McDonnell. What is less well know is that their demon bowler, Spofforth, who took 14 wickets for 90 runs in the match, might have had a Yorkshire-born father, but his mother’s maiden name was also McDonnell. By the early years of the twentieth century, however, there are some – admittedly sketchy – records of a group of cricketers, deep in the Australian bush, running what amounted to the first rustic version of a cricket academy with young players, inducted as early as eight years old, fed almost exclusively on kangaroo and potatoes. Quite how this shadowy secret society came to be known as the Dandy Bradmans is still shrouded in mystery, as they clearly pre-date the emergence of Australia’s most famous batsman. However, many believe that Donald was not Bradman’s first name originally, but was bestowed on him to remind him of his mysterious, potato-bearing, benefactors. The Dandy Bradmans might have begun the trend, but by one means or another, the remaining cricketing nations with large Scots-Irish populations came to learn that the Celtic fringes were a rich source of cricketing talent – particularly when exposure to the legends of Twistleton-Smythe and his Redcoat XI, and industrial quantities of tatties, happened from an early age. How else can one explain, for example, the deadly Nineties paring of Allan Donald and Shaun Pollock for South Africa, and Donald’s most famous hour during the 1998 Trent Bridge Test when he almost literally tried to decapitate Oxford-educated England captain, Mike Atherton? The long line of Aussie fast bowlers such as Jeff Thomson, Craig McDermott, and Glenn McGrath? Even in New Zealand, where the quality of their cricketers has possibly suffered from the less potato-focused mutton diet, the most successful batsman on this year’s tour of England went by the name of Hamish Rutherford. It is not clear how these underground groups influence official selection panels in Australia and elsewhere: whether by direct means or some form of indirect persuasion. The current Aussies have struggled to build a side as great as Ricky Ponting’s, and one reason might be the relatively light numbers of players with obvious Scots-Irish forebears. However, there are some signs of hope. One is Nathan Lyon, the spinner, who is the very definition of a wee bauchle. But there is more. 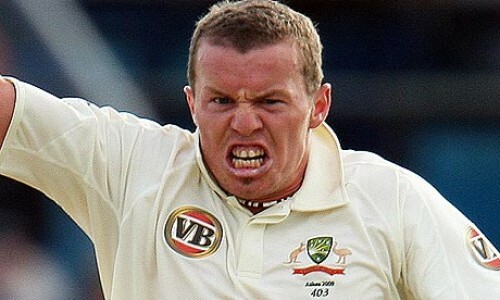 Look at the picture below of fast bowler Peter Siddle, likely to make the starting line up for the first Test. Ignore the English-sounding name. If you’ve never seen a face like that next to you at the bar, willing you to spill his pint, you’ve obviously never been drinking in Glasgow at all. Although apparently he eats bananas rather than tatties….